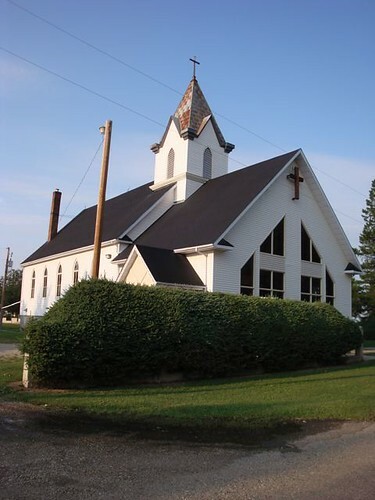 St. John Evangelical Lutheran Church of Golden Spike was founded in 1928 by predominantly German Lutherans and was a part of the Manitoba Lutheran Synod. Today, St. John’s is a member of the Alberta Synod of the Evangelical Lutheran Church in Canada. St. John’s is located in the community of Golden Spike, which is about 20 minutes of west Edmonton, and 15 minutes of Devon, Spruce Grove, and Stony Plain. St John is an open country congregation, yet very close to major urban centers. As Lutherans, we believe that we are justified by grace alone through faith alone, which means that God’s love which is undeserved, yet freely given. We are a confessional church, meaning we begin from Christ the Word as our foundation. We believe the Word is witnessed to primarily in Scripture, and further witnessed to in the three Ecumenical Creeds, and the Lutheran Confessions. From this centre, we move out to engage the world and bring the good news of Jesus Christ to all people. Our worship is liturgical, based in the traditions that have been brought forward from the early church, but we try to incorporate new and fresh expressions as well. But most importantly, we gather to connect more deeply with God and with each other, so that we can grow more fully into who God wants us to be. St. John is open to all who would like to come and be a part of our community of faith. We’d love to have you join us!